I'm Claudia form Barcelona (Spain). Since I was a child I were atracted to art and painting because of my uncle and now I'm studing Fine arts. I've a sister 2 years older than me (I'm 20) she is bead addicted and is studing fashion desing. 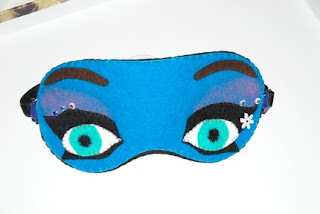 My sleep masks crafts start when I've decided to do a handmade sleep mask (for me). 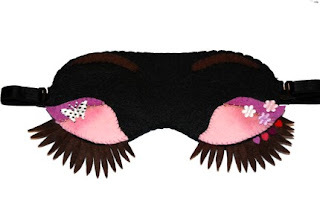 I was searching internet and think to do a inspirated Breakfast at Tiffany's sleep mask. But not the same, I would like to do it with my own desing. Then I tought that I can try sell this at my Etsy sotre. My surprise was when this sleep mask was sold. I love Arts and Crafts, tv series, beads, kawaii, vintage, felt. I would like to make things that you like to wear with a smile in your face. I want to do crafts and have fun with this. My sister have a store there and encouraged me to sell my prints. But they aren't successful so I've decided to do my own crafts and sleep masks. All my items are done with care and love. To do my items I have to think about it, search internet, make some sketches and a pattern. Then I love to use felt, cotton and decorations like appliques and beads for my creations. *How do you promote your work? I think that work and photos are the best promotion. But is too useful to be at internet sites like blogs, flirck ... and add them to google. I'm searching for marqueting tecniques! 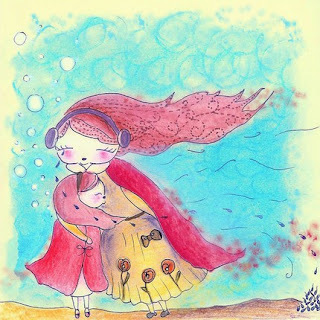 Hello Nil and Claudia and everyone featured on this nice blog! Thank you Claudia, very much for having me as you favorites! This is great. Your masks are so cute!!! the first time I saw you hearted me, i could not stop looking at your avatar! it was one of the masks and it was so cute and looked like someone was watching me! haha!! they make me smile! Thanks, have a great day everyone, I enjoyed this blog today! :-) and I love Nil's YOYOS!! !